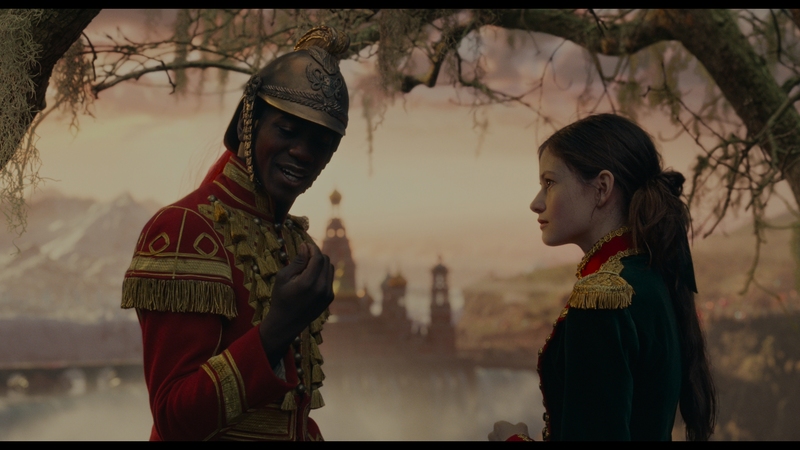 What a blundering blob of… stuff Nutcracker and the Four Realms is. It’s frantic for attention, slathering the screen in masses of computer generated fantasy, color, and movement. It’s all so busy and muddy and garish. What’s lost is any sense of fantasy. Disney attempts to bridge this tale with their Alice and Wonderland’s billion dollar success, but this lacks the careful mania of Tim Burton. 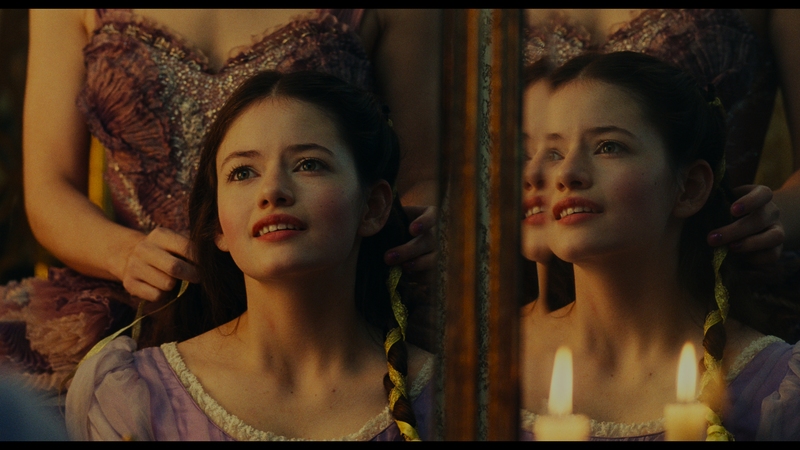 Nutcracker becomes a case of gaudy excess for the sake of it, all to take away from the story’s heart. Seen between the slits of overdone effects is a predictable fairy tale dud, where the villain isn’t the villain, a girl learns her worth, and kids can process the effects of ballet propaganda (?). 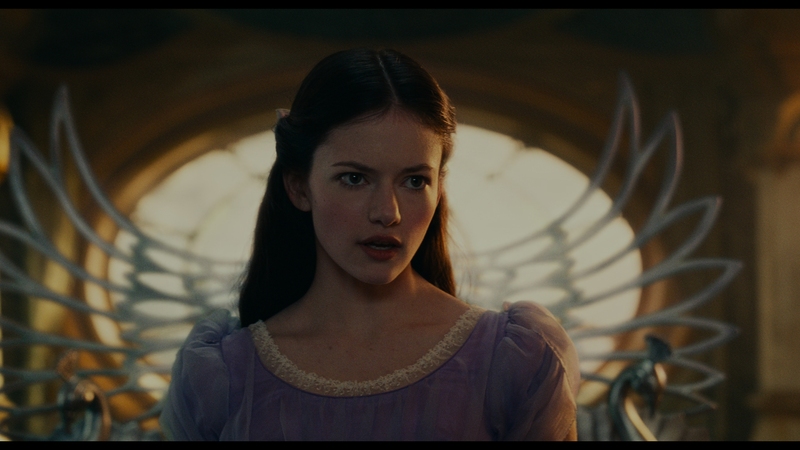 Mackenzie Foy tries as the lead role as Clara, bright and cheerful once inside the fantasy realm. She’s escaping from the reality of her mother’s death. This is Disney so dead moms at Christmas is their technique. Foy ends up surrounded by snow and castles. The Russian origins remain, giving life to nesting dolls and notable architecture. Soon, Keira Knightley enters, obnoxiously pitchy in her speech to capture a pixie-like vibe. Instead, listening to her is equivalent to a first grader learning to use the recorder – poorly. Her voice is the gift you give the kid of a parent you don’t actually like. To some credit, Nutcracker changes the story around. The focus turns away from the Nutcracker soldier, instead settling on Clara’s destiny as the daughter to a former queen. That’s a modern adaptation, empowering for young women to see a smart, mechanically gifted girl conquer a kingdom with her wits. Kudos for that. Unfortunately, that feels dimmed and buried under the girth afforded to this movie by mountains of digital effects. The best sequence of Nutcracker comes during a ballet, with only a smidgen of computer generated help. This is the lone scene in which Nutcracker represents the true surrealist nature, with physical sets dropped into the frame and costumed creatures on the attack. In the end, that bit of truthfulness turns into a distraction – the ballet’s story is misdirection to turn Clara away from truth. Don’t believe what you see. That’s a great message in a film trying so hard to invoke feeling from artificiality. At least Nutcracker has that self-reflective honesty going for it. Shot on a mixture of 35mm and 70mm, the 2K finish blends the two. Unlike say, Mission Impossible – Fallout where the IMAX footage creates substantial difference, here everything flattens with no standout sequences. Instead, Nutcracker looks offensively bland. Grain structure softens, and so does the entire image. On UHD, the appearance is that of an upscale, and not a good one either. Although a handful of close-ups produce an expected level of definition, the rest softens as to rob Nutcracker of breathtaking quality. This doesn’t appear as a choice of cinematographer Linus Sandgren (First Man) but the lackluster transfer process. Consider too the listless HDR pass. Nutcracker features a bevy of sun-lit exteriors and interior candle light. There’s no vibrancy though, no energy to crank up depth. A scene of Clara in bed at night loses all sense of true black, leading to some visible blocking. Highlights never reach out. Sure, Nutcracker displays a bevy of color. Yet these too dim and blend together. Hawthorne, the ruler of the flower realm, wears a variety of hues. Those muddy up and bleed out, messy without distinction. 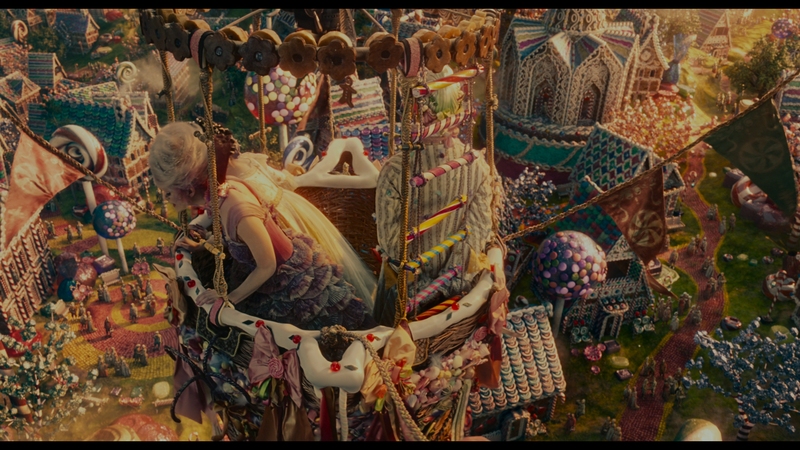 With the exception of some exterior shots depicting the kingdoms (especially the candy space), the color, like the rest of Nutcracker’s UHD, falls apart. Going in with lower expectations after the UHD helps. Nutcracker features the same softness on Blu-ray, but less impactful when considering the lower resolution of this format. Marginal detail shows up when in close. Some of the costumes shine. 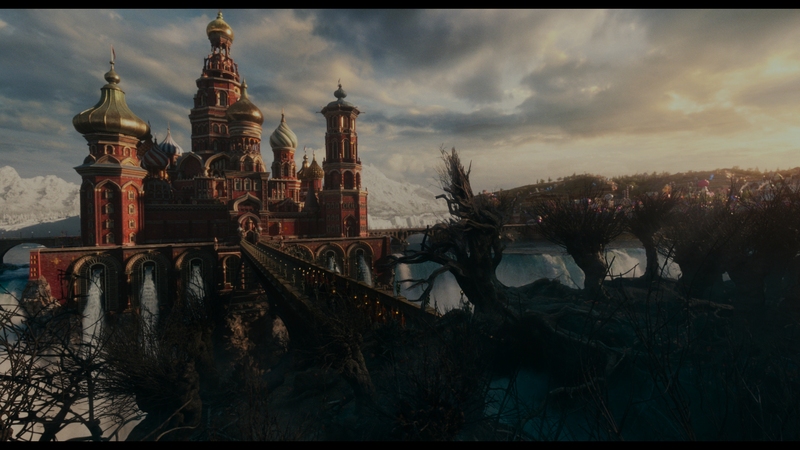 Overall brighter, Nutcracker lacks the density of the UHD yet the less restrained color is preferred. It’s not great either way though. Nutcracker can’t buy a win. Mild LFE response gives this adventure limited weight. Scenes of a giant, living circus tent hardly elicits any boom. Massive action scenes actively avoid the subwoofer. Aside from a few moments in the score (hearty drums), Nutcracker sounds compressed. Surround work is at least fun. Mice travel through the soundstage and a sequence inside a clock recalls the awesome work done on Hugo. Tin soldiers march around, clanging as they go. The Atmos mix is also fond of sending voices to the rears, adding space. Jump to the Blu-ray for this stuff. The UHD offers nothing on its own. Ballerina Misty Copeland offers her thoughts via On Pointe, a four-minute brief on her involvement. A pale making of runs seven minutes, with five deleted scenes and some music performances up last. 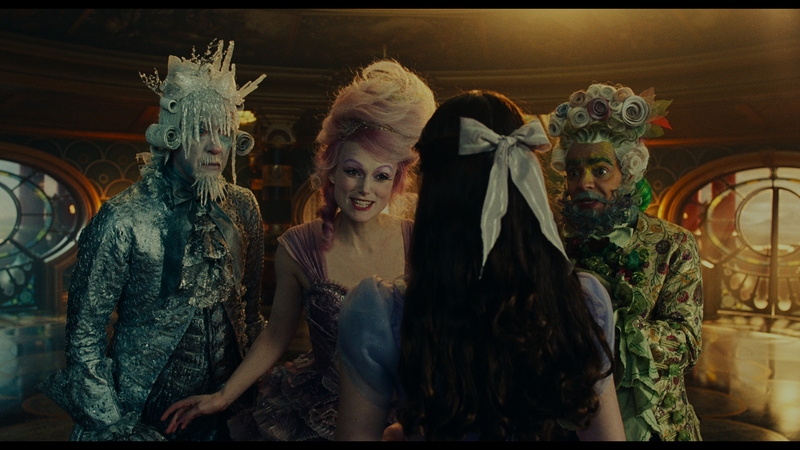 Nutcracker and the Four Realms alters the original story with good intentions, but it’s suffocated by its overdone effects.